Power sectors around the world are undergoing significant change due to the rapid uptake of new supply- and demand-side technologies. In particular, large-scale wind and solar power as well as distributed energy resources are influencing the planning, operation and profitability of power systems. In response, policymakers, utilities and other stakeholders need to apply innovative approaches to transform the power system, with the objective to achieve sustainable, affordable and reliable electricity.The Status of Power System Transformation 2017 report provides an overview of current trends that are ongoing across the globe, with a focus on the integration of renewables and local grid development. The report examines a broad set of recent concrete power system interventions. 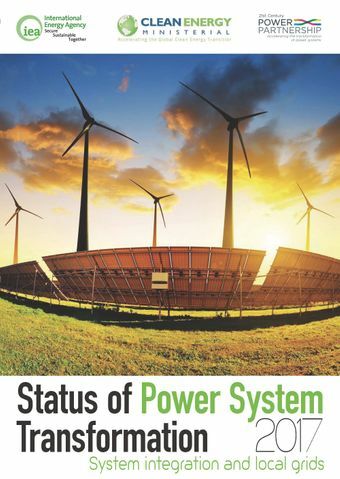 A framework for assessing the status of power system transformation is also introduced, and is applied to selected countries: Indonesia, South Africa, Mexico and Australia.This report can inform stakeholders of the dynamic changes that are occurring in power systems around the world and provide insight into measures that can help to overcome new challenges.